1 Pump, 1 Aerial Rescue Pump Wholetime, 1 Pump Retained. 5/11/2010 to Station Commander ? Photo of Greenock Fire Brigade Medal and Retirement Watch. (2) The Town Hall, built in 1766, after a plan by Mr. Watt. It appears from the burgh records, excerpts from which have been kindly communicated to the compiler by Mr. George Williamsom, writer, that, before the erection of that building, the magistrates held their courts in a wooden shed in William Street, which served the three fold purposes of town hall, post office, and fire engine house. We mention this circumstance for the purpose of showing how far behind the town of Greenock was at the middle of last century, and how rapidly it has grown since that period. In 1950 accommodation comprised of Municipal Buildings, Pre-fabricated Hut and four bay garage across the road, shop premises as Canteen further along the street. The esturial fire boat was put out of commission when dry rot was discovered in the hull in 1950. 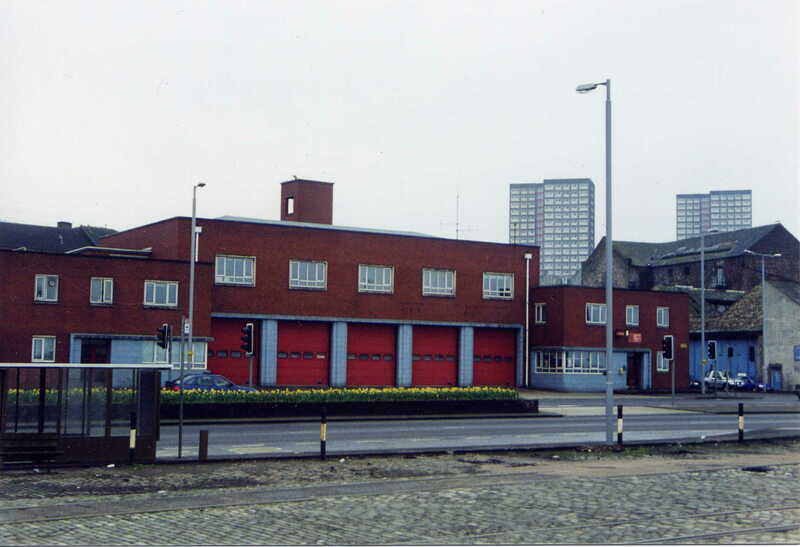 From what I can gather the retained unit was formed in 1948 under the Western Area Fire Brigade. Greenock was Station B1 in the Western Area Fire Brigade. The Wholetime staff are splint over 5 Groups each consisting of 1 WM, 2 CM and 7 Ffs. Each Group has an extra man. In 2015 manning of the ARP was reduced from 6 to five, so the now run 5 and 4. The other day, the Greenock Fire Brigade staff with their appurtenances were removed from their temporary location at the foot of the Vennel to the new and commodious premises provided for them in the most recently completed section of the Municipal Buildings at the corner of Wallace Square and Dalrymple Street. The contrast between the past and the present condition of things is very great indeed. The chief entrance to the station has been placed in Dalrymple Street, on the level, and the passage into the interior is wide and high. There is within on every hand a roomy aspect. Already the various apparatus connected with the brigade has been stowed and arranged in a methodical manner and at the readiest points in case of call. Here one of the two fire escapes has at length found a fitting resting-place, and some necessary repairs having been executed upon it, it is now as good as new. Mr Taylor, superintendent of the brigade, has, with the aid of some old materials succeeded in constructing a light forward carriage for this escape, so that it can be run along .the streets in a horizontal instead of a perpendicular position. The other escape, which has been left at Prospecthill, to be serviceable for the upper levels of the town, is, we are informed, through the long exposure to the elements, become almost wholly destroyed. The brigade station is apparently replete with all requisites for such a place, and there are even stalls for the horses which the Town Council will probably have some day. Mr Taylor has a comfortable apartment to himself, with window facing Wallace Square, but it would battle the most ingenious to find out the entrance. The great drawback in connection with the station is that there are no means, either through bell or doorway, of giving an alarm of fire from Wallace Square. The only ingress is by the large gateway in Dalrymple Street, and to reach the office of Mr Taylor the long passage, court, and wide interior has to be traversed. The residences of Mr Taylor and one of his staff are in the building, whilst the others live, across the street, so that all are at hand in cases of emergency. The arrangement of the new station has been pretty much at the disposal of Mr Taylor, who has been successful in getting many improvements made on the original plans. The result is on the whole very satisfactory, and it may be expected that for the future the labours of the staff will be got through with less friction and fewer drawbacks than formerly. There will still, however, in cases of fire be the delay occasioned through the want of horses on the premise, and it is in this direction of reform that Mr Taylor intends now to exert all legitimate influence. The fire brigade premises are worthy of a visit, and any one of the citizens who has a wish to look round will be made welcome. 3/2/1912 Saturday, Bellaire, a west end mansion belonging to Patrick T. Caird, extensively damaged by fire. 9/2/1912 Page 2 Greenock Fire Engine Committee going to discuss purchasing motor engine. Cost will be under �1000. 27/4/1912 Fire at Poynters. The Hose Ladder was first in attendance, but it was apparent it was a serious fire and Firemaster Taylor ordered the Steamer be sent for. This was the largest fire in the district since the distillers fire about 9 years ago. With the official opening of the new Fire Station in Rue End Street now past, it already has been functioning operationally, it is interesting to take a backward glance at the old Greenock Fire Brigade and the men who fought local fires in years now long past. Two of these faithful "nags" were known as Rory and Kate. When they were not racing to fires they helped to pull tram cars to Gourock. This no doubt helped to keep them in trim for the occasions when their horse-power would be required to get them to the scene of fire outbreaks in good time. Names that stood out in any reference to those who fought those Greenock and district fires are Taylor and McCartney. Three generations of Taylors were local firemen and they all gave distinguished service to the community in quelling many serious conflagrations in days when equipment was not nearly so good as it is today. His son was with the local brigade for 36 years. He joined in 1903, but being brought up more or less at the local fire station, was steeped in its traditions long before that. Indeed he was one of those who rendered assistance in fighting the disastrous Ardgowan Distillery fire, one of the most serious conflagrations in local history. On the death of Mr Taylor, sen. in 1915, Mr John McLean, then assistant, was appointed Firemaster. When Mr McLean retired in 1929, Mr Taylor, jnr, was made his successor and was in charge of the local station for 11 years when he resigned in 1939. The record of the fire service by the McCartneys was equally noteworthy. Mr William McCartney, whose son David lives at Jamaica Lane, served the local brigade for 50 years. His son, William, was connected with it for 40 and David himself for 11. David possesses a certificate which does more than anything else to pinpoint the lowly wages firemen received in those days. This certificate written in the hand of David's Uncle George, who was a local firemaster himself and inventor of the bayonet hose coupling, used throughout the world, shows that all William McCartney received as an auxiliary fireman was �4 a year! That was in 1867. Yet for all the meagreness of their wage packets these old firemen worked hard and long hours, contending with difficulties, partly imposed by the lack of fire-fighting facilities as we know them today. For his long and helpful services to fire-fighting Firemaster George McCartney was awarded a medal in 1909. Six bars on it testified to the worthiness of the award. The first motorised fire engine came to Greenock in 1912. It was a capable of developing 72 h.p. Its driver was a certain Mr A. K. Davidson, later to become a Gourock Bailie and now secretary-manager of Gourock Ex-Servicemen's Club. He remembers the vehicle well. It had solid tyres so that when it was driven along Greenock's cobbled streets it made a noise "like a miniature shipyard". "The din it created was so nerve shattering that pedestrians, and there were jay-walkers in those days, too-lost no time in dashing out of its way whenever it appeared on the streets." Just before the advent of this "clattering contraption " ,boon as it was in relation to its comparative speed in getting to a fire-local firemen pinned their faith on an engine drawn by two horses: supplied by the burgh police. One of the drivers was a Mr Andrew Webster. Today, fire-fighting facilities have improved out of all proportion to those of the past. Modern equipment and speedy communications have eased the firemen's burden so that one might be inclined to regard the old fire-fighters as "slow". But that would be grossly unfair. Fire-fighting has always been and will continue to be a serious business and those men who fought our fires in the past were as expert at the job as their modern counterparts. Beards and moustaches were popular adornments when this picture was taken of Greenock Fire Brigade outside the Dalrymple Street Station in 1893. Those in the photograph (left to right ) -Back row- A. Haldane, W. McKay, W.Denoon, J. Campbell, J.Walsh, F.Danielson. Middle row-W. Peaston, R. Paterson, W.Gray, Superintendent W. Taylor, and Wm. McCartney. Bottom row- J. McLean, Assistant Superintendent W. Wood, J. McNicol and W. Greenless. This was the "four-in-one" horse drawn "engine" that raced to local fires around 1880. The picture was posed for during a lull from fires on the Esplanade. Note the "outrider" with his jockey like attire. It's a far cry from the horse-drawn rig to the spanking new appliance which on Friday "opened" the Dellingburn fire station by being first out on the street. SCOTTISH SECRETARY, Mr John S. Maclay, pressed a button at four minutes to three yesterday afternoon. Sliding doors moved almost magically, two fire engines and a fire escape hurtled into Rue End Street with sirens screaming. Eight seconds later they were back in place, having circled the building, and Scotland's newest and most up-to-date fire station was formally open. The chair was taken by Dr J. W. McFarlane, Chairman of the Western Area Joint Fire Committee. He was supported by Fire Master Robert Bowman of the Western Fire Area, Mr J. K. Raye, Vice-Chairman of the Joint Committee, and Dr J. Dickson Mabon, burgh MP. Provost Reid of Greenock was present, as was Mr James Neil, architect of the new building. In the body of the hall were Greenock's Chief Constable, Mr David Williamson, and many local councillors. The Secretary of State was introduced by Dr McFarlane, who outlined the long negotiations which had preceded the building of the present Stations. He explained how the project was first mooted in 1956, but hitches over planning had taken place. Now the job was done, and he was proud to ask the Scottish Secretary to perform the formal opening. Mr Maclay said he had waited a long time to return his thanks to the fire service generally for the fine service they had provided to everyone in the district. "It isn't every day." he said "that a Secretary of State can so freely combine his joint duties as Member and Minister without embarrassment, and so you will realise that I have seized this opportunity with alacrity." He congratulated Mr McAlpine on his appointment to the chairmanship of the Association of County Councils, and as he went on: "I must also congratulate the Provosts of Gourock, Greenock and Port Glasgow (and I list them in alphabetical order!) for the very high honour they were paid recently when they were presented with the Silver Medal of Paris. What rights this confers on them I do not know, but I wish them well. It is very gratifying that our French allies should honour our local dignitaries in this way." "No-one, certainly, could know the needs of the area better for he has been here since 1937, when he was Firemaster at Paisley. It was during the war that he extended the range of his activities to all our benefit." The very high efficiency of the Western Fire Brigade was, to a large extent, due to Mr Bowman's efficiency. Mr Maclay concluded by appealing for recruits to the Auxiliary Fire Service. "If the cataclysm of war should again overtake us," he reminded, "the Fire Service would need the assistance of every trained man they could get their hands on. It's no use waiting until such an emergency arises. "What is wanted is a number of men to come forward for training in their spare time, and I am sorry to hear that so few people in this area have hitherto realised this need." A cheque for �50 was presented to Mr Bowman by Mr James Neil, on behalf of the architects and contractors, for the benefit of the Greenock Fire Station Welfare Fund, and Provost John Reid moved a vote of thanks to Mr Maclay and Dr McFarlane. There followed a conducted tour of the new premises, and tea was taken in the new canteen. The fire service in Greenock dates back to 1753 when a fire engine was bought and housed in the shed in William Street, which also provided a home for Greenock's first post office. Over the next 137 years the fire service was to operate from a number of locations including Church Lane, Taylor's Close and, from 1881 to 1887, the foot of the Vennel. In January 1887 the Fire Brigade moved into the New Municipal Buildings. Situated at the corner of Wallace Square and Dalrymple Street the new premises included accommodation for the horses which were needed to pull the engines. At times, however, the same horses could be seen pulling the tramcars to Gourock. The first motorised fire engine was introduced to the town in 1912. Greenock was one of the few local authorities in the country to have their rights as a fire brigade authority established by law, in this case under sections of the Greenock Corporation Act 1909. In 1938 the Fire Brigades Acts repealed many of the sections of this act whilst setting up national legislation. From July 1938 Greenock, along with Glasgow, Aberdeen and Dundee, lost the right to send an account to the owner or occupier of premises to which the fire brigade had been called. As compensation for the loss of annual income of �300 the council received �8,000 from the government. Before the war Greenock Corporation had decided that the town needed a new fire station and when the new authority took over in 1948 the search for a new site continued. The choice finally fell on a site at Rue-end which was being used as an open-air annexe to Western SMT's Dellingburn Garage and had been the site of St. Laurence's Church, destroyed by German bombs on 7th May 1941, and the Victoria Picture House. Today the official tests of the new motor turbine fire engine, just acquired by Greenock Corporation, were carried out at Fort Matilda. There was a large and representative company to witness the demonstration. The new fire fighter, weighing four tons, is of the latest type, and is built on a compact and handy design. She has been supplied by Dennis Bros., Guildford, London and her cost is �1,085. The engine is of an enclosed vertical type, with six separate cylinders, developing a maximum of 75 b.h.p. A speed of thirty miles per hour is easily attained on a rising gradient of approximately 1 in 10 to 12. The equipment carried includes Gwynne's powerful turbine pump, delivering 500 gallons per minute at 140 lbs. pressure. Over 1500 feet of hose can be carried, and there is a 40 ft. telescopic ladder in 2 sections, arranged over the machine on brass pillars, with a roller at the rear to facilitate removal. The Fire Department, of which Bailie Orr is convener, is to be congratulated on its enterprise in providing Captain Taylor and his staff with the means of expeditiously and efficiently overtaking the work of the brigade. <PHOTO> (Rear view of UHS171) Bearing a county registration number, the new hose-foam tender is ready to go into action. As yet, however, it has not been in attendance at fires to which the local brigade have been summoned. In this picture Leading Fireman Willie Donnelly stands by the nozzle of the hose at the ready. One of the most up-to-date pieces of firefighting equipment has arrived in Greenock. It is a �6,000 five ton tender which has been specially adapted by Firemaster Joseph Hartil, chief of the Western Fire Area, for carrying flaked hose and foam compound. The vehicle carries a mile of 3 � inch hose, and sufficient foam compound and foam making branch pipes to tackle a major oil fire or similar risk. It cuts down the need for two vehicles as was previously necessary. The outstanding advantage, however, is that where normally firemen had to pay out hose from a hydrant to a fire some distance from the supply, this tender is fitted with mechanism which does this work. It does it, too, as 25 miles per hour-a tremendous saving in time. �Greenock and district now has one of the most modern vehicles in the country,� said Divisional Officer James Ferrie today. The tender is fitted with the new authorised Blue Beacon which is to be the distinguishing mark of all emergency appliances. It has now been fully tested and is now in service. It will have a crew of its own in each of the three shifts and will be manned 24 hours a day. 7/1/2008 The Portacabins started to arrive today. They are being set up around the drill tower 12 large ones double decked, 2 large on their own and a half size one. The appliances will be kept in the bays until work on the actual bays begins. 31/1/2008 Inverclyde Council Building Control request more work done to the Portacabins complex, move from station delayed. 4/2/2008 The station will be handed over to the contractors.
? Moved into Portacabins, only using bays 1,2 & 3 in station. Oct 2008 First in Bay 4 and second with retained machine behind it in Bay5. Bays 1, 2 & 3 being renovated. 22/4/2009 Dayshift. Crews moved out of the Portacabins and into the station, power off in Portacabins, workmen still doing work in the station. Fire Brigade rooms have red doors and Police rooms have blue doors. It will be at least a couple of months before the Official Opening takes place. 23/9/2009 Official re-Dedication ceremony by Councillor Brian Wilson, convener of the Fire Board. Photos of exterior during refurbishment. <PHOTO> This means that there was a photo in the newspaper, the photograph is not on this site unless it says See Photo in blue.